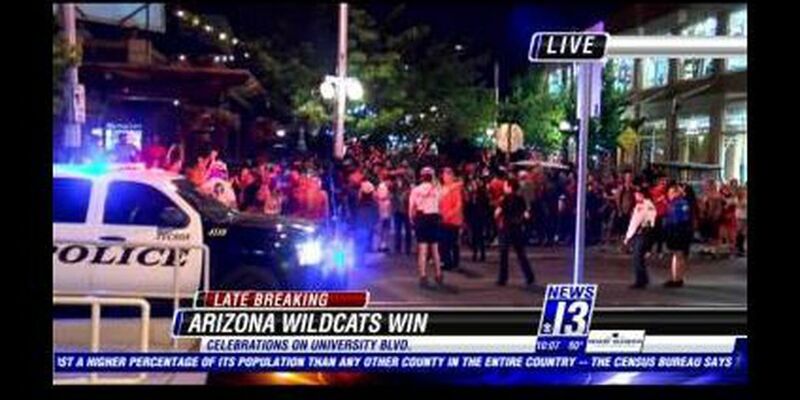 TUCSON, AZ (Tucson News Now) - A victory celebration by Wildcat fans filled University Boulevard in Main Gate Square Thursday night. A sea of red ran into the street and on the streetcar stop between Gentle Ben's Brewing Company and Frog n Firkin after the University of Arizona men's basketball team beat San Diego State to enter the Elite Eight. The fans filled the street about 10 p.m. After ten minutes, Tucson Police in protective gear began to walk the road and tell fans to move to the curb. By 10:30 p.m., most of the people had left the area and police had University Boulevard clear again. Tucson Police have been preparing for such situations this year. A 1997 National Championship over Kentucky and a 2001 loss to Duke both led to celebrations getting out of control on Fourth Avenue.